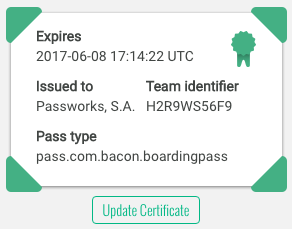 When a certificate for your Pass Type ID is expiring you need to reissue a new certificate and upload it to the platform. 2º Locate the expiring certificate and press the Update Certificate button it. 3º Follow the instructions on the update certificate page, or continue reading the instruction bellow. 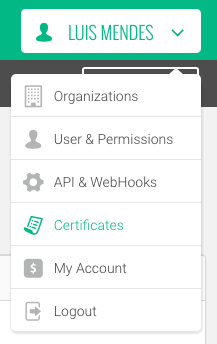 Click in Certificates, IDs & Profiles under the Overview menu. Under Identifiers, select Pass Type IDs. Find the Pass Type ID that you are searching for (see ID column) and click on it. Click Continue on the About Creating a Certificate Signing Request (CSR) page. Click Download and save the CER file (normally called pass.cer) containing the Pass Type ID certificate to your Desktop.